See the table below for a run-down of this product's specifications. 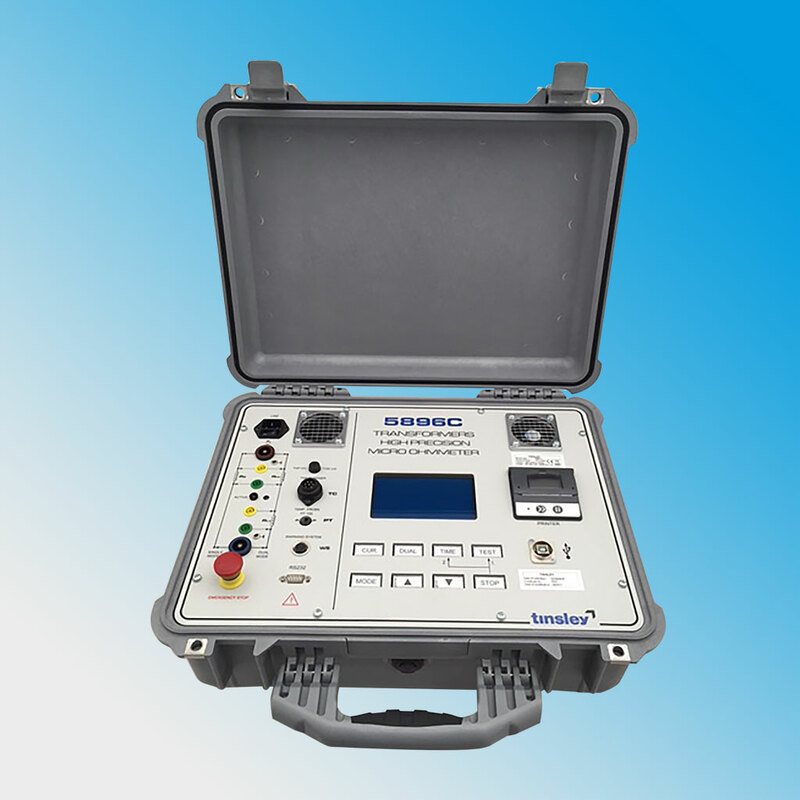 The Tinsley 5896C is specifically designed to measure the resistance of highly inductive loads such as transformers, motors and generators. It has a measurement resolution of 0.01µW for the 20µW range and can measure resistances up to 6kW. Transformers up to 500 MVA and above can be measured. A specially designed current source is used to quickly saturate the device core and obtain a stable resistance reading in the shortest possible time. So that the highest resolution of the reading is always displayed, range selection is performed automatically and therefore is not necessary to be set by the operator. When required, a temperature compensation feature allows the reading to be corrected to the 20°C equivalent value by either entering the actual temperature of the unit under test or by using a PT100 temperature probe. A correction can be selected for either copper or aluminium windings. When used for automatic “Heat Run” tests, measurements are made at preset time intervals and an internal algorithm is used to calculate the resistance at t=0. The transformer is made safe after testing by discharging stored energy into the 5896C attenuation resistor and varistors. Only a negligible residue will remain when the discharge warning light indicates that it is safe to remove the test leads. The 5896C uses the four-wire measurement technique to eliminate the effect of the resistance of the test leads. By using the dual inputs of the 5896C it is possible to measure both a low voltage and the high voltage winding of a transformer at the same time. This can greatly reduce the time taken to produce cooling curves with an added advantage that the stability of the low voltage winding measurement can be improved when the high voltage winding is energised by the 5896C at the same time. The 5896C can be used to control the transformer tap changer. Therefore automatic measurement is possible with no need to remove the current between each tap change. During switching the inputs of the instrument are protected to avoid damage that could occur should a tap changer prove to be faulty during testing.